This profile is of a sprinter and not a distance runner which makes it unusual on this site but it is included because of the circumstances of a particular race. I had originally written it as one of a series of Clydesdale Harriers profiles and Ward is undoubtedly a man of his time. The race in question is a challenge race for a trophy specially commissioned and presented to the winner. With a club as notable and as long lived as Clydesdale Harriers, the difficulty in any such work as this the question is who to include and who to leave out. Many champions, international representatives and hard working club men have been omitted. 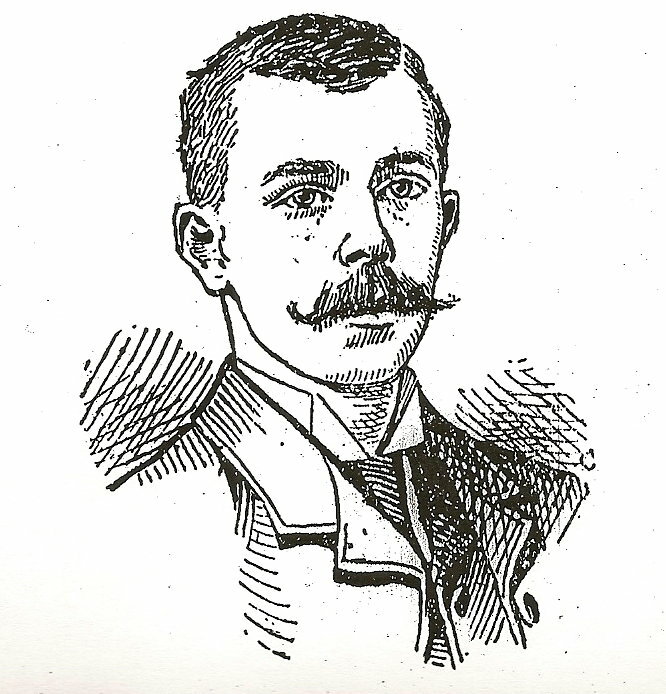 GT Ward had a very successful athletics career but has been included because in 1887 he was involved in a challenge match which represents an aspect of the sport that has long disappeared. When Clydesdale Harriers was formed one of the main athletics talking points for some time had been the challenge matches between WG George and J Cummings in England. Where their three challenge events covered three races at different distances, the GT Ward and T Blair match was a one race shoot out. GT Ward was a founder member of the club who ran in the club’s first track race – a 300 yards handicap race at Meadowside. He came from the Parkhead area of Glasgow and his father had been an Army sprinter who won several races ‘open to the entire forces.’ His sons were reported to have inherited his ability and George who was the younger first raced in 1883 in the West of Scotland Sports where he was third in the 440 yards to AS Blair and followed this up with second in the 220 yards at the Vale of Leven Sports to Peter Logan. His best meeting that year was at the Abercorn Sports in Paisley where he was first in the 100 yards, first in the 440 yards and second in the 220 yards. 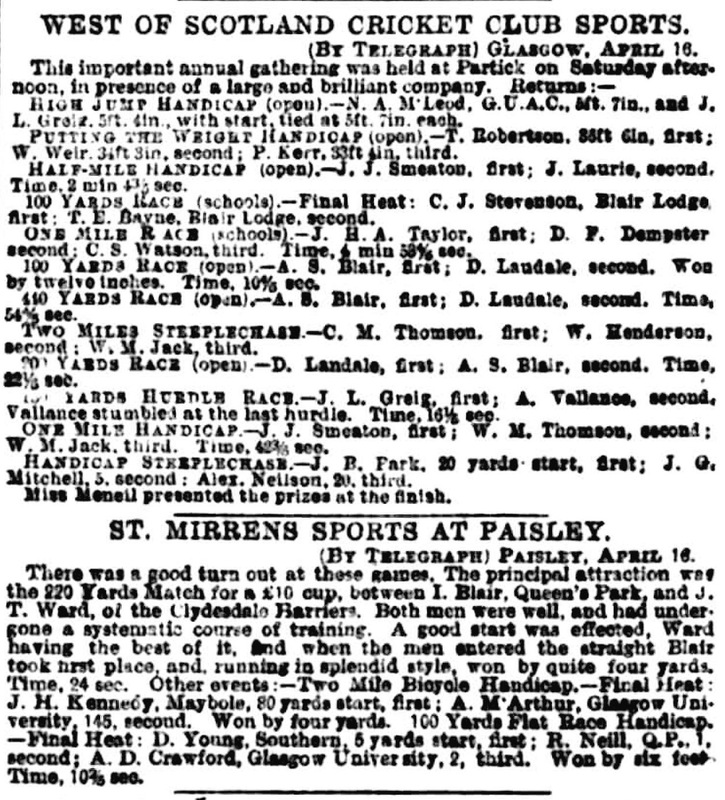 He was clearly a runner of some ability when he was challenged by to a race over 220 yards by T. Blair of Queen’s Park FC. The race itself was covered in the ‘Scottish Umpire’ of 19th April 1887 as follows. Challenges such as that between GT Ward and T Blair were fairly common among the top men. As mentioned earlier it was at about this time for instance that WG George and J Cummings fought out their three race, two man challenges over various distances between one mile and ten miles. The challenge would be issued, the response made, seconds nominated, terms agreed and the match made. It seems strange to us in the twenty first century that athletes would put themselves on the line like this when so many of the top men (and women) avoid each other as much as possible, preferring to achieve qualifying times in Europe, America, England and not at home against each other. It might do more to improve recruitment and standards were the practice of man to man racing reinstituted. His favourite distance was said to be 100 yards and he would have been clear favourite to take the SAAA Championship title in 1888 had his ankle not been injured and giving him considerable difficulty. Although he won three races that year, the title was not one of them. 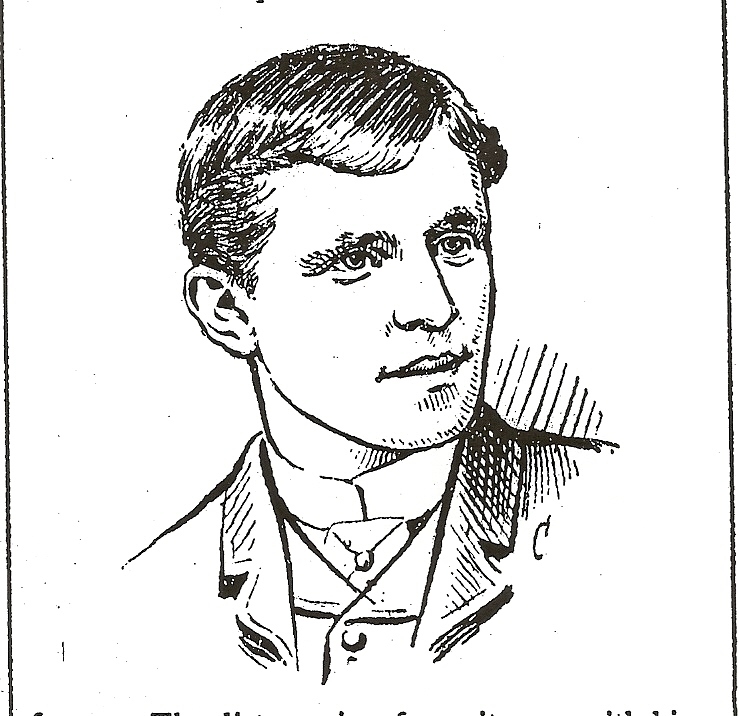 “The Scottish Umpire” reported in 1890 that he had been very unfortunate due to accidents. Presumably ‘accidents’ = ‘injuries’.